The skin around the eye area is very thin and therefore requires special care. 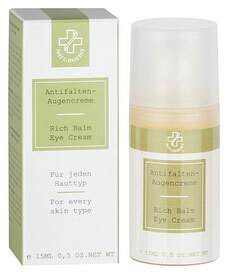 Nourishes and protects the delicate skin around the eye area. Contains high quality ingredients such as plant ceramides, avocado, macadamia nut and wheat germ oil. Without KVO-listed preservatives, PEG´s and mineral Oils. In the evening, apply a small amount to the skin around the eye after cleansing and tap it in gently.